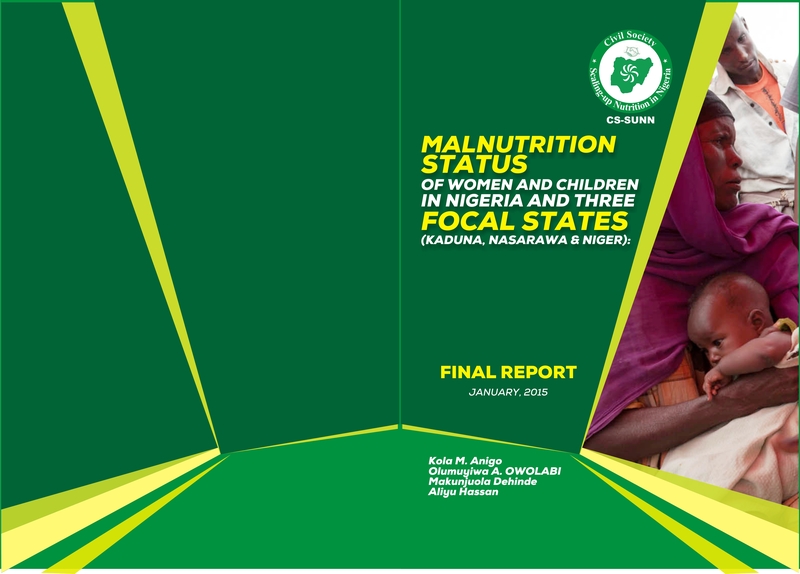 The report on status of malnutrition at the national and three focal states shows that 37% of Nigerian children under 5 years of age are stunted……………………… It is concluded that malnutrition in the country and the focal states is still very high. Stunting, an index of chronic malnutrition is decreasing but wasting, an indicator of acute malnutrition used for examining short-term effects such as seasonal changes in food supply or short-term nutritional stress brought about by illness and underweight, a composite measure of stunting and wasting and a recommended indicator to assess changes in the magnitude of malnutrition over time are increasing with high level of micronutrient deficiency and poor infant and young child feeding practices. Addressing this scourge of malnutrition requires strengthening ongoing cost-effective interventions with integration of multi-sectoral efforts……………………………. The Civil Society Scaling Up Nutrition in Nigeria (CS-SUNN) under its PACFaH project presents the report on the status of malnutrition scheduled for Wednesday 17th of June, 2015 at Bolton White hotel, Area 11, Garki, Abuja from 9.00 am prompt.